Jakarta is the capital city of Indonesia, a country which consists of colorful archipelagos; either in nature or culture. Jakarta is a hustle-bustle city, located in Java island, equipped with all kinds of modern transportation and the largest airport in the whole country. Even though it has its modernity, its rich history isn’t effaced by it. Jakarta started out as a small port on the estuary of Ciliwung River around 500 years ago. As the centuries passed, the port city eventually grew into a buzzing international trade center. Previously named as Jayakarta, the Dutch took over and named it as Batavia and changed into Jakarta in the hand of the Japanese. Eventually, Indonesians’ sense of nationalism won over the colonizers. Ir. Soekarno proclaimed Indonesia’s independence and heirloom. Jakarta’s ethnic people is the Betawi people and they speak Betawi-Malay. There is also a slang form of the ethnic language, which spoken by young people in Jakarta among their friends. Even though Indonesians in different regions speak in their own ethnic language, Bahasa Indonesia is one language that unite all of us. Universitas Indonesia is located in Depok, West Java. The pre-clinic students attend lectures and practicals there. As for the clinical students, they attend their clerkship at Rumah Sakit Rujukan Nasional Cipto Mangunkusumo in Salemba, Central Jakarta. Faculty of Medicine Universitas Indonesia (FMUI) was originated also in Salemba, next to Rumah Sakit Rujukan Nasional Cipto Mangunkusumo. However, the campus building is now being reconstructed to be a research facility for all of the students and faculty. FMUI is now lead by a dean named DR. dr. Ratna Sitompul, SpM(K). We have two classes, regular and international class. The international class students go abroad to have international clinical education in their third year. As for the fairly cheap airport shuttle, there is a bus called Damri. It can be used from airport to various locations in Jakarta and will cost around IDR 40.000. But getting around Jakarta is one different problem. The city layout is chaotic and totally bewildering, traffic is indisputably the worst in South-East Asia with horrendous traffic jams (macet "MAH-chet") slowing the city to a crawl during rush hours (several hours in the morning and in the evening), and the current railway system (Jabodetabek Commuter Line) is better. Some tourist attractions also are available in certain stations. The commuter line will cost around IDR 12.000. Other than commuter line, TransJakarta, a city bus, is also a choice. It will cost around IDR 3.500. But as for the horrible traffic, Indonesian entrepreneur invents an online motorcycle taxi that can be book by smartphone application. It is fairly convenient and cheap (it will cost around IDR 10.000-20.000, depends on how far your destination is) that it is now being used throughout Indonesia. There are many tourism sites in our city, Jakarta. Taman Impian Jaya Ancol, also known as Ancol Dreamland, is one of the most popular tourism spot in Jakarta. It is currently the largest tourism area in South East Asia, consisting of theme park, hotels, and many other recreational facilities such as water park and sea world. The theme park, known as Dunia Fantasi (Fantasy World), is the main attraction in Ancol Dreamland. Taman Mini Indonesia Indah (TMII) is another “must-visit” destination in Jakarta. This park shows the cultural aspects from every province in Indonesia through a wide collection of traditional houses, clothing’s, dances, and miniatures of Indonesian archipelago. TMII also has theatre called Keong Mas Imax which shape resembles giant golden snail. 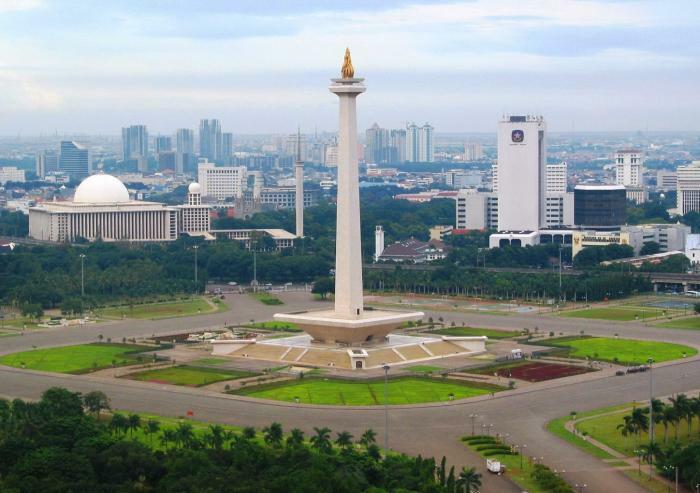 Monumen Nasional, better known as Monas, is also a favourite tourist destination in Indonesia’s capital city. This national monument is 132 metres tall and symbolizes the fight for Indonesia. A form of flame covered by gold can be seen on top of this tower. If you want to reminisce the old Batavia, there’s no better place for you other than Kota Tua. Another favourite tourism spot, Kota Tua consists of Dutch-themed buildings spread in approximately 1,3 square kilometres area. All the buildings left are heritage of colonial times in 16th century. A wide variety of Jakarta’s traditional food can also be found here. Jakarta is the center of Indonesia’s history. There are many interesting museums, from art to history. Experience the semi-traditional market to massive shopping malls, Jakarta has surprisingly interesting shopping destinations. Never forget to experience Indonesia’s culinary! All through the year, the climate enjoyed by Jakarta remains hot, very hot in fact, due to Indonesia's closeness to the equator. Plentiful sunny weather sees temperatures frequently top 30°C / 86°F every single month. High humidity levels can make the weather and climate of Jakarta feel a little sticky, and so light, cotton clothing is essential, as is an adequately air-conditioned hotel room. Although temperatures in Jakarta rarely fluctuate more than just a few degrees, it is a completely different story when it comes to rainfall. It is better to always prepare your umbrella. We have many traditional food and drinks, such as roti buaya, kerak telor, es sekoteng, and many more. But you should give some effort to find those foods and drinks because it is rarely found nowadays. You can ask us to take you to place you can find those foods and drinks. People in Jakarta usually dress politely. Currency which use in Jakarta is Indonesian Rupiah (IDR), and you will find some money changer near our campus since our campus is located in strategic place. You also will find bank, and ATMs in our campus. Indonesian people eat rice as primary carbohydrate, so you won’t find pasta or mashed potato on canteen easily. The common flavour for food is quite spicy, and use a lot of ingredients so it will taste very good. We will conduct welcoming party, 1-2 social program on weekend and one farewell party.